The following write-up appeared in “The Guardian”, April 29, 1994, inserted by his niece, June (MacPhee) Taylor, to the memory of a beloved uncle. GORDON: Fifty years ago, on April 29, 1944, many lives were lost in the sinking of the HMCS Athabaskan. One of those lost was Murchison Gordon, of Appin Road, P.E.I. In May 1945 the following obituary appeared in the Guardian, written for the family by Mrs. George (Margaret) Dixon, the well-known writer of “Ellen’s Diary”. Lloyd Murchison Gordon presumed killed in action when HMCS Athabaskan was sunk in battle in the English Channel, April 29th, 1944. Murchison (Murky) joined the Navy Oct. 31, 1939, at the age of 19, taking his basic training at the Charlottetown Naval Barracks, thence to Halifax, July 1940. Early in 1941 he went overseas on the Canadian destroyer, St. Francis, as a gunnery rating, returning to Canada in September of the same year. His next sailing was on the newly built corvette HMCS Oakville, where for more than a year and a half he served as a gunner down in southern waters. It was while on convoy duty there, the crew of the Oakville sank a German U-boat, when Murchison, as captain of the gun-crew credited with the sinking, received mention in dispatches for “distinguished service”. This action was in the Caribbean Sea when with complete disregard for his own safety, and in order to get his gun back into action, he immediately removed the hot charge of cordite from the breach of the gun when the third charge misfired, throwing it with all his might into the sea. He returned to sea aboard HMCS Athabaskan, which was torpedoed and sunk in the morning hours of April 29, 1944, “still firing at two German destroyers that struck at her in the haze of a starlit night”. On April 30 the radio carried the news of the sinking and anxious relatives awaited further word. Although he was reported “missing” on May 2nd, hope was entertained that he had been taken a prisoner of war. However, In October last, his mother was informed that he was not among those taken, and on Jan. 15th last, the official report was received: Presumed killed in action April 29, 1944. News of Murchison’s untimely death was received with sorrow and regret, not only by his family and loved ones, but by all those who had been privileged to know him. Murchison was born in Appin Road Dec. 19, 1920, the youngest son of John Gordon who predeceased him by six years, and Mamie MacLeod Gordon. He was a most likeable lad possessed as he was, of a kind and sunny disposition, attractive and manly personality, and a splendid physique. He spent much of his time in Clyde River, with his brother-in-law and elder sister, Mr. and Mrs. Arthur MacPhee, and was greatly attached to the small niece and nephews there. He spent two days of his final shore leave with Mr. MacPhee in England, only nine days prior to his death. The remaining members of his family who sadly mourn the passing of a brave, dutiful and affectionate son and brother, are his mother, Mrs. John Gordon now living in Charlottetown, two brothers, Lewis, Appin Road, John a S.B.A. at the HMCS Queen Charlotte, Charlottetown, two sisters, Cassie, Mrs. Arthur MacPhee, Clyde River, and Miss Florence, Crapaud, five nieces and nephews all mourn the loss of a loving and considerate uncle: John and Ann Gordon, Appin Road, June, Tommy and Artie MacPhee, Clyde River. The following is an excerpt from an article that appeared in “The Guardian” in April 1945, part of a feature called “Ellen’s Diary”. The author of “Ellen’s Diary” was Mrs. George (Margaret) Dixon, who had written the previous obituary, and who knew Murchison Gordon, and was a friend and neighbour of his sister Cassie Gordon MacPhee. This, the last of April’s days brought sunshine, most welcome too after only occasional rays of it recently. I knew even before I was fully awake, a pleasant day was ahead. By the brightness of the bird-calls, all a-twitter this morning, by the strident crowing from the poultry house and by the gentle swaying of the now-tossled silver-birch. Yesterday, Judy termed “a mean day”, for Saturday’s showers continued throughout the day, and it needed stout heart to make ready for and attend rural church services. Judy went alone - twice. When she returned her curls were wind-blown, her cheeks pink from baffling with wind and weather and her winter outfit of brown was only most comfortable to wear. There were flowers, she told me in the morning in memory of a gallant sailor-lad who before the war spent much of his time with his sister in the vicinity. She lived then in a stone-house on the highway, an old house, I suspect surpassing many of the others in age. Although, as yet I am not acquainted with its origin, it must have been owned at one time by the Lane family. For near the rear of the farm there is a steep cliff of rock and a spring bubbling forth from a fissure runs out to join the river nearby. This cliff, James and others of the older settlers in Braeside (Clyde River) speak of as “Lanes’s Rock”. And this young sailor, who knew the fields there and the fishing spots and the Rock is gone far from these scenes forever. 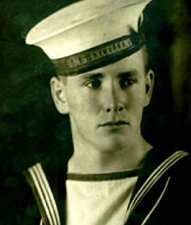 With another brave Island sailor, he was missing after an engagement with enemy U-boats in the English Channel. “Only in dreams shall we behold them” --- this lad and others. Judy described the flowers in the Church as “roses”. There were beautiful pink ones and buttercup yellow ones. Fragrant white and pink carnations too - - all for remembrance. I have them beside me as I write. Through the sorrowing family’s thoughtfulness, the mailman left them at our box this morning.